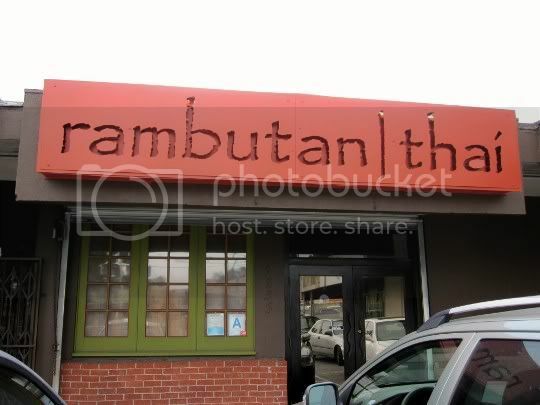 For what looks to be a hole in the wall in the middle of a strip mall in a somewhat questionable area of Silver Lake, Rambutan Thai is a surprisingly nice dining experience. A simple orange sign hangs above the tucked-away corner restaurant; but step inside, and the warm sophisticated decor makes you think you're in one of the more chi-chi areas of Los Angeles. Orange raw silk adorns the walls of one side of the restaurant, while an earthy, bright olive green paint covers the other. Seating and furniture are dark wood, and the dim interior track lighting with the occasional decorative lamp provides just enough mood lighting...but not in that annoying way that makes reading the menu difficult. A "full" bar serves a wide variety of yummy-sounding soju cocktails, beer, and wine. And how stylish are the orange chopsticks used for simple place settings? 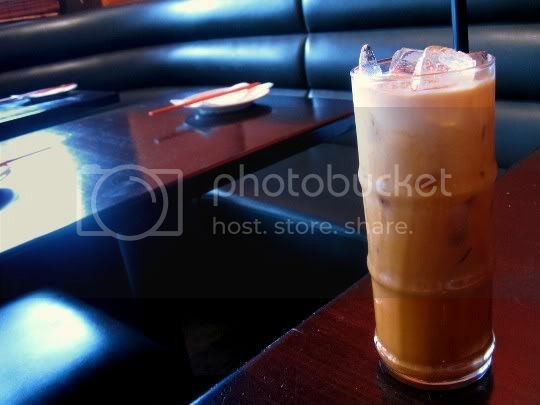 Thai Iced Tea, $3.00: The staple beverage for every Thai meal. Thai iced tea is usually made with milk, evaporated milk, or even half-and-half...but I think this place definitely uses cream. This drink was thick, almost too thick...almost like drinking Thai iced tea flavored cream. For some reason, it also had a slight coffee flavor; this wasn't a bad thing, just sort of odd. One thing I did like was that it wasn't terribly sweet, like some places seem to make their versions. I did let the ice melt a little to water it down, and then it was a little more normal. 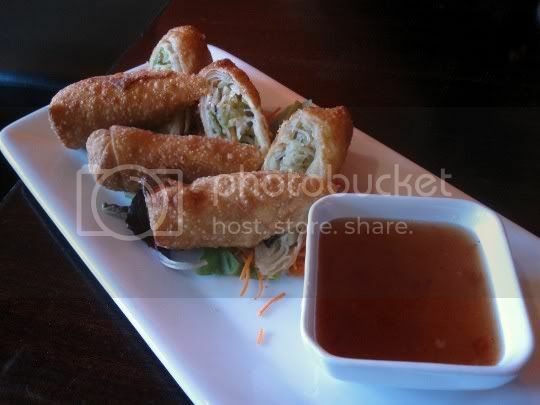 Egg Rolls, $6.00 for 3: Deep fried, crunchy, and crisp, egg rolls are Asian comfort food at its best. This version, unlike the traditional Chinese kind, seemed to be very lightly battered before being fried. A sort of deep brown coating on the outside kept the inside relatively untouched by the oil, although something on the inside layers like cornstarch (probably from using fresh wonton skins) coated my tongue. The rolls were filled with shredded cabbage, carrots, mushrooms, celery (? ), and rice noodles, plus a heavy seasoning of black pepper...and I like that they slice them open so the diner can see everything. The plum chili dipping sauce was super sweet, tangy, and spicy: a great complement. My one complaint about these is that the oil didn't taste super fresh, like it had clearly been through about two or three fry sessions before. They're also best eaten (as with most fried foods) right away while still hot and fresh. 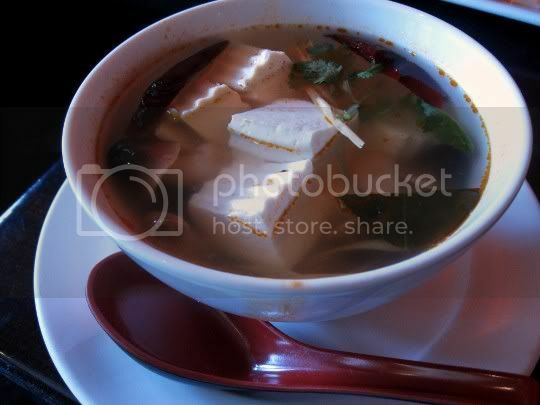 Tom Yum (Lemongrass) Soup, $6.00 cup: The waiter assured me that this soup was vegetarian-friendly, as it's water-based and contains no chicken or seafood broth. Yay! A hot, steaming bowl arrived, and the aromas were almost intoxicating. Pungent, sour, sweet, tangy. The broth was almost addicting: the lime juice definitely was at the flavor forefront, but there were elements of fragrant lemongrass and spicy chile oil. Strangely enough, I didn't think the soup was that spicy and could have used a bit more of a kick. Big chunks of raw tofu, mushrooms, and a few pieces of cilantro completed the bowl. There is a substantial amount of tofu used, so I'd suggest NOT getting a tofu entree is you plan on ordering this soup, as it's a bit of an overload (and I love tofu!). 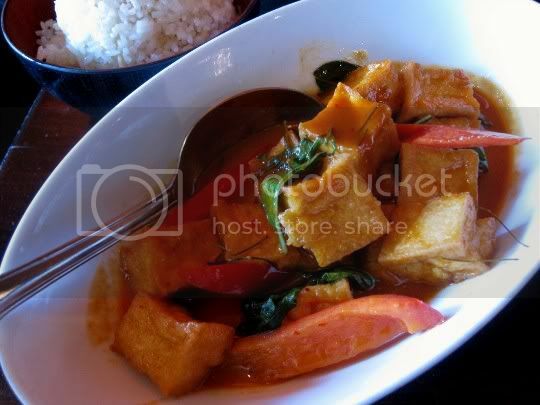 Panang Curry w/ Tofu (w/ Garlic Rice), $10.00: One of my favorite curries of Thai cuisine, panang is basically red curry paste and various herbs simmered in coconut milk...so rich and spicy are key. Rambutan's bright red-orange, velvety smooth version is surprisingly salty, but the other flavors do seem to balance it out. Although the menu says the dish is "mild," that background heat element snuck up on me after a few bites. Fragrant Thai basil adds some sweetness. Sliced red bell peppers and perfectly fried tofu cubes soak up the sauce and make this oh-so-delicious. Served with a side of garlic rice (other options are jasmine or brown) brings the flavors to new heights: the garlic is STRONG here, and shreds of fresh ginger make this spicy, fragrant, and sharp. The rice is perfectly cooked, moist, and lightly salted. Eat here again? Definitely. It's a bit far for me to travel, as there are plenty of decent Thai restaurants in my immediate LA area...but Silver Lake is a cool place and Rambutan should be on the itinerary.